B&M is a leading 8K/4K video audio equipments and solutions provider in designing, manufacturing and marketing video infrastructure products and solutions for the high-end video audio broadcast, video over IP networking and transmitting markets. B&M designs, produces and provides the broadcasters and customers with all ranges of the high end quality TRUE 8K/4K HDR UHD digital video audio delay lines, base band processors, TICO & LLVC NMI codecs, transcoders, converters, UHD SDI switchers, signal distributors, keyers, the digital & IP products throughout the world which are used in all stages of 8K/4K UHD & VR ultra high quality video processing systems. TRUE 8K/4K HDR UHD Digital Video Audio Solid State Delay Lines without any data compression. Compatible with TRUE 8K/4K HDR UHD SDI or TICO/NMI IP variety of signal standards & formats. Really the world's longest delay time, up to 60 seconds 8K UHD signals in increments of 1 frame steps . . . . .
ULTRA series is a set of extremely powerful 8K/4K video processor, TICO or LLVC NMI format encoder, decoder, transcoder & IP Switcher Gateway devices to convert 8K/4K UHD SDI to & from IP in a variety of formats, very reliable and efficient bridge solutions between UHD SDI & IP formats . . . . . .
B&M ​won Outstanding Broadcasting Technology Product Award. B&M gained the high recognition and praise from RedBee Netherland. 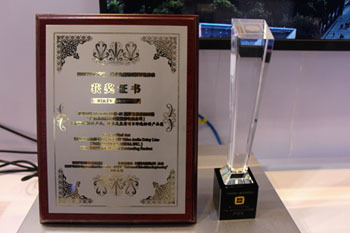 B&M won Technology Innovation Award in BIRTV2018.